Tofino is a town located on Vancouver Island in British Columbia Canada. Strategically positioned on the western terminus of highway 4, Tofino has become one of the top tourist destinations in Canada and receives tens of thousands of visitors each year. For individuals who are considering going on holiday to this location, the following overview of tourist activities and attractions in tofino, British Columbia can prove invaluable. By car Tofino can be easily accessed through highway 4. However, it is recommended that you drive during the day due to the winding nature of the road and also to enjoy the great scenic view synonymous with this region. By plane Tofino Ucluelet airport is located 20 kilometers to the south of tofino. There are daily flights by local airlines to the tofino airport. Hot spring cove is located to the west of Tofino. This location is one of the major tourist attractions in this area and features a natural hot spring network in form of interconnected pools at various temperatures. If you are a nature lover, hiking to this site is highly recommended, as it will give you an opportunity to enjoy the scenic beauty of Tofino. Tofino is considered as the surfing capital of Canada and many sport lovers from all over the world come to Tofino specifically to surf. Winter is considered as the best surfing period due to the high waves experienced at this time. ‘Surfing during winter?’ you might ask yourself. Winters at Tofina are usually mild and the temperatures are moderate enough for surfing to take place. Some of the popular surfing locations in Tofina include Chesterman beach and Cox beach. Tofina, British Columbia is also a very popular camping destination. Camping is highly recommended during summer and there are a number of private and public campsites in Tofina. These include Green point, Crystal Clove and Bella Pacifica. There are a number of festivals which usually take place in Tofino each year. Tofino whale festival – this is a festival to celebrate the spring migration of gray whales. It takes place in March. 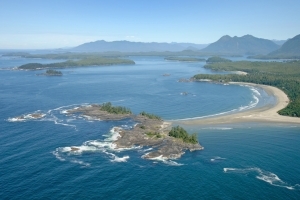 The beaches along Tofino are part of the gray whale migratory route. As such, whale watching is one of the most established tourist attractions in Tofino. There are many tourist agencies which offer boat watching as part of their packages. The Tofino region is home to a sizeable black bear population. These bears usually come out during low tide to comb the beaches for crabs and other marine animals. There are specific sites offered to tourists for bear watching with appropriate protection by wildlife personnel. By visiting, these sites and taking part in some of the tourist activities stated. Your stay in Tofino will be a memorable one.